In general, HF power amplifiers (especially those in the kilowatt range) have very high current demand when supplied with 120V AC. They work much better and are more efficient when powered with 220-240V. An added benefit is that the AC current draw drops in half giving less chance for the standard 15A household breaker to trip. My existing electrical panel - power is supplied to the house by 2 hot wires (single phase) and a neutral wire (which is also grounded in the panel as per NEC) . These are the 3 black heavy wires in the middle of the picture. They are connected straight to the outside service (the electric pole transformer on the street). There are 120V between each hot wire and the neutral (common) wire and 240V across both hot wires. These lines are actually connected to the center-tapped 240V secondary winding of the power transformer outside. Each end of the winding is a "hot" wire and the center-tap is the common. To install a sub-panel I needed first to install a double-pole breaker in the main panel to serve as a feeder (main) breaker for the sub-panel and bring this way the outside service to the sub-panel thru the double-pole breaker in the main panel. Here is the new sub-panel, attached to the plywood. I installed 8 (16) position 125 Amps sub-panel. This should cover all my future needs. The double-pole 100 Amp breaker is installed at top-right in the main panel. Three AWG #4 stranded copper wires serve as feeder for the sub-panel. Wire size #4 should be able to handle up to 125 Amps (something very unlikely to occur). The green wire (AWG #6) is used to connect sub-panel's Ground to the main panel. This is the 30A in-line RFI filter - Corcom 30VB6. 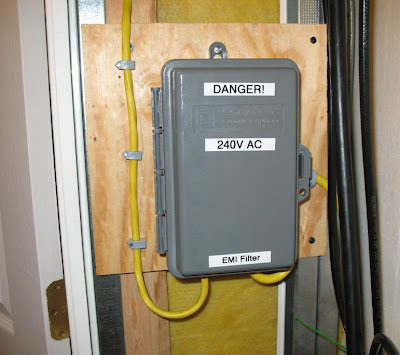 This AC filter is rated at 25A/240V or 30A/120V and provides pretty good attenuation throughout the HF range. The insertion loss is over 50db at 30 MHz. I have similar filters on the line powering the rest of the shack and on the line powering all of my computers. This means that the insertion loss is over 100 db between devices from each group. To accommodate the filter I used electrical box from a "pull-to-disconnect" device sold for Air Conditioners. It accommodates perfectly the EMI filter and provides the necessary high-voltage safety. I noticed that in your sub feed, you have the two hot wires inside one piece of smurf tube and the neutral+ground in another piece. That might be a violation of national and/or local electric code. Using two conduits for that subfeed is indeed a NEC violation. It also radiates excessive EMF because the magnetic fields formed between hot and neutral are not able to efficiently cancel out. This makes your EMI Filter humorously ironic. yes..I am aware that using two conduits is a NEC violation and I intend to fix it at some point. Not for any other reasons but to make the inspector happy next time he pays me a visit. A couple of points tho: The sub-panel is serving my 240V HF amp and I hope you are as familiar with 240V service as you are with NEC - there is NO NEUTRAL and BOTH lines are HOT when using 240V. Both hot lines are actually the secondary winding of the center- tapped distribution transformer. The center tap is grounded and it is the neutral as well. Each half - between the end and the center-tap is one of the two 120V circuits (single split-phase). In a typical household wiring, different loads are connected to different halves of the transformer windings and an attempt is made to distribute the loads evenly across both circuits. In practice this is never the case - one load (the refrigerator for instance) will be operating for a period of time loading one half of the winding more than the other. What is humorous is to think that you are dealing with balanced transformer or even balanced panel, feed, etc. Furthermore, you are talking about common-mode currents/noise caused by different return paths (ground and hot) and asymmetry in the feeder, while the EMI filter is intended to deal with differential-mode noise between the two hot wires (caused by other loads). In addition, the length of each wire to the sub-panel is the same and very short! The proximity between the wires over this short distance is such that it is humorous to me that someone might think the two plastic conduits are affecting the twisted-pair effect.